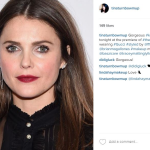 Celebrity makeup artist Tina Turnbow created the luminous look for Keri Russell for this week’s premiere of ‘Dawn of the Planet of the Apes’ using Juara Skincare and Votre Vu products. It’s a personal beauty best for ‘The Americans” star, no? “I began by having Keri cleanse her skin to start with a clean slate. Next, I took Juara’s Tamarind Tea Hydrating Toner on a cotton ball and applied it all over her face letting it settle in. It helped to close her pores and prep her skin for the moisturizer. For Keri’s look, we decided to go with a modern, 50s feel. I started by sweeping a light linen eye shadow all over her lids as the base. Then, using Votre Vu’s Le Joli Crayon in Charbon, I drew a line from the inner corner out with a little flick at the end to give a lift to the eye and a cat-eye feel. Taking the smudger on the other end of the eye pencil, I smudged the wing a little bit on the outer corner into the crease to extend the eye, this opens up the eye more than if you were just to have a straight line. For her cheeks, I used the Vu-On Rouge in Ma Cherry on the apples, and then took a bit of the Vu-On Rouge in Amourette on the top of her cheek bone to give it a bit of a pastel pink highlight. For her lips, we went with French Kiss in Tatiana, it’s a bit sheer and not too strong which I really like. It’s a modern take on a red lip. I used my finger and tapped it onto her lip and blurred the edges so it didn’t have a heavy harsh line to it. Then I took the Vu-On Rouge in Amourette and tapped it onto the center of the lips. What do you think of Keri Russell’s look?